Mega Sale! Save 23% on the Accent Plus Wall Mail Rack, Butterfly 2-tier Decorative File Folder Magazine Rack Wall Mount by Accent Plus at Home Decor Outlet Store. MPN: 9C-FC3B-367E. Hurry! Limited time offer. Offer valid only while supplies last. The lovely design and pretty flourishes make this a great catchall for your mail, magazines, or important papers you want to keep within reach. 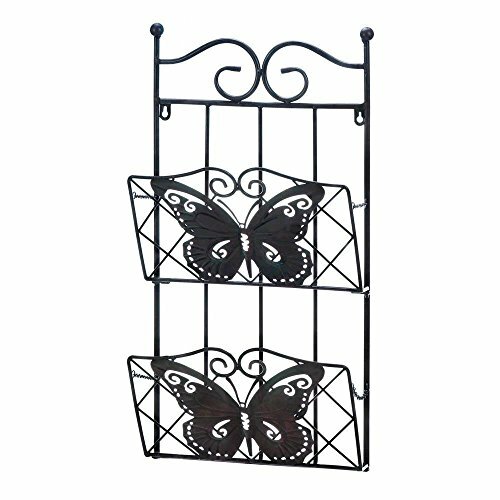 Two pretty butterflies and plenty of organization make this wall rack a must-have for your home. Weight: 3.6 pounds, dimensions: 12.2" x 6" x 23.8".